Four additional results are worth highlighting. First, there are indeed many Canadian think tanks: these results include 44. Having such a crowded playing field may explain much of the general public’s confusion about which think tank fits in where ideologically. 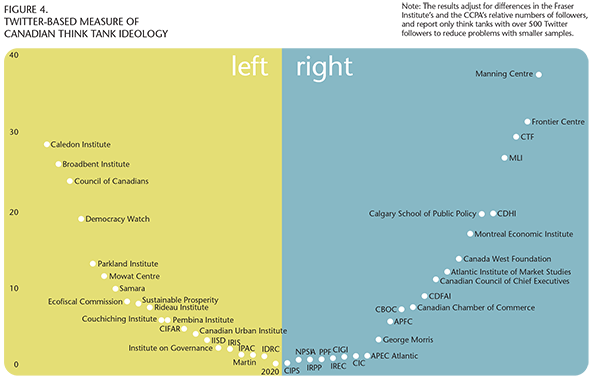 Second, according to my ideology measure, Canadian think tanks seem to be about evenly split on the left-right continuum: there are 21 think tanks to the left of centre and 23 to the right. Third, the smile isn’t exactly symmetric. In this sample, and with this measure, the average “right-wing” think tank appears to be a bit more “ideological” than the average “left-wing” think tank. That said, the difference is not that large and may simply reflect what Halberstam and Knight found in the US: that conservatives are actually more tightly connected on social media than liberals. Fourth, my preliminary analysis did not suggest any systematic relationship between ideology and Twitter followers. In other words, it does not appear that more extreme ideologies on their own are associated with a larger Twitter following. … That said, we should always be careful when reducing a complex issue to a single number along a single dimension. The concept of ideology is inevitably problematic. Moreover, think tank ideologies are not uniform within a given organization and they change over time. Finally, of course, readers should not use these results to prejudge, discredit or approve of research by any of these organizations without a thorough reading of that research. I emphasize that these simple results are preliminary and just a first step; much more work is needed to better understand these complex issues. The ideologies of Canadian economists, according to Twitter – Macleans.ca. 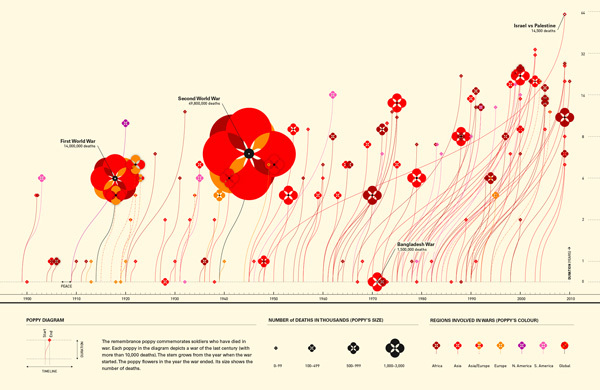 The Best Infographics of the Year: Nate Silver on the 3 Keys to Great Information Design and the Line Between Editing and Censorship | Brain Pickings. Fast forward to July. StatsCan technicians were updating the Labour Force Survey computer systems. They were changing a field in the survey’s vast collection of databases called the “dwelling identification number.” The report doesn’t explain what this is, but it’s likely a unique code assigned to each of the 56,000 households in the survey so that analysts can easily track their answers over time. They assumed they only needed to make this change to some of the computer programs that crunch the employment data, but not all of them. The changes themselves were happening piecemeal, rather than all at once, because the system that collects and analyzes the labour force survey is big, complicated and old it was first developed in 1997. Despite being a pretty major overhaul of the computer system, the report makes it clear that the agency considered the changes to be nothing but minor routine maintenance. After updating the system, no one bothered to test the changes to see if they had worked properly before the agency decided to release the data to the public, in large part because they considered it too minor to need testing. One of the programs that was supposed to be updated — but wasn’t — was the program that fills in the blanks when people don’t answer all the survey questions. But since technicians had changed the identification code for households in some parts of the system, but not others, the program couldn’t match all the people in July survey to all the people in the June survey. The result was that instead of using the June survey results to update the July answers, all those households who didn’t answer the questions about being employed in July were essentially labelled as not in the labour force. With the push of a button, nearly 42,000 jobs disappeared. How StatsCan lost 42,000 jobs with the stroke of a key – Macleans.ca. 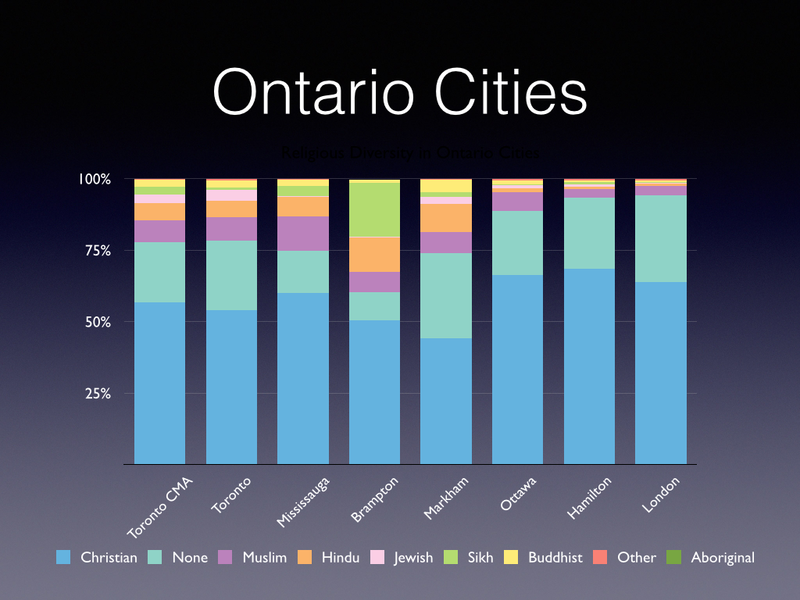 As some of you may know, working fairly intensely on analyzing and charting Canadian multiculturalism as seen through the National Household Survey data from 2011 (not as reliable as the Census but what we have). In looking at how to make charts as simple as clear and possible, came across some good design and related sites. The above sample is illustrative of the work I am doing. For a wider choice of colour palettes, see Every ColorBrewer Scale. Any feedback or suggestions always welcome. People should get agitated about Statscan over substantive issues. Wring your hands that the CPI over-states price changes over long periods. Write your MP complaining that the Labour Force Survey doesn’t follow the U.S. practice and exclude 15 year olds. Take to the barricades that for an energy superpower like Canada, measuring energy exports has become a monthly adventure, routinely revised by $1-billion a month. But don’t use the July employment incident to evaluate how the statistical system is functioning overall. They messed up one data point in one series. Big deal. Anyone who lets one data point affect their view of the economy should not be doing analysis. Move along folks, nothing to see here. Don’t beat up Statscan for one data error – The Globe and Mail. Last year, Stephen Gordon railed against StatsCan’s attention deficit disorder, and its habit of arbitrarily terminating long-standing series and replacing them with new data that are not easily comparable. Statistics Canada must be the only statistical agency in the world where the average length of a data series gets shorter with the passage of time. Its habit of killing off time series, replacing them with new, “improved” definitions and not revising the old numbers is a continual source of frustration to Canadian macroeconomists. As far as Statistics Canada’s troubles go, this will never get the same level of attention as the mystery of the 200 jobs. But, as it relates to the long-term reliability of Canadian data, it’s just as serious. Given my work using NHS data, particularly ethnic origin, visible minority and religions, linked to social and economic outcomes, still in the exploration stage of what data and linkages are available – or not. A good visualization that helps one understand relationships and relative weight of comments. Facebook’s trending pages aggregate content that are heavily shared “trending” across the platform. If you’re already logged into Facebook, you’ll see a personalized view of the trend, highlighting your friends and their views on the trend. Give it a try. Now open a separate browser window in incognito mode Chrome: File->New Incognito Window and navigate to the same page. Since the browser has no idea who you are on Facebook, you’ll get the raw, unpersonalized feed. If you’re rooting for Israel, you might have seen videos of rocket launches by Hamas adjacent to Shifa Hospital. Alternatively, if you’re pro-Palestinian, you might have seen the following report on an alleged IDF sniper who admitted on Instagram to murdering 13 Gazan children. Israelis and their proponents are likely to see IDF videos such as this one detailing arms and tunnels found within mosques passed around in their social media feeds, while Palestinian groups are likely to pass around images displaying the sheer destruction caused by IDF forces to Gazan mosques. One side sees videos of rockets intercepted in the Tel-Aviv skies, and other sees the lethal aftermath of a missile attack on a Gazan neighborhood. Worth reflecting upon. I try to have a range of news and twitter feeds to reduce the risk. Israel, Gaza, War & Data — i ❤ data — Medium. Finally, we see a big limitation: This data reveals only correlations, not conclusions. 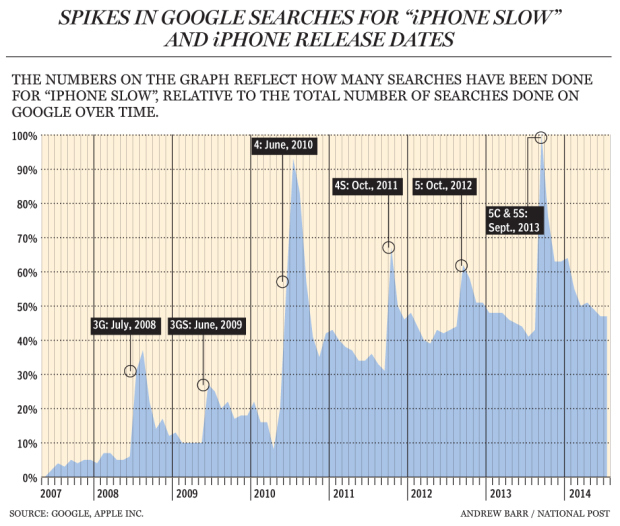 We are left with at least two different interpretations of the sudden spike in “iPhone slow” queries, one conspiratorial and one benign. It is tempting to say, “See, this is why big data is useless.” But that is too trite. Correlations are what motivate us to look further. If all that big data does – and it surely does more – is to point out interesting correlations whose fundamental reasons we unpack in other ways, that already has immense value. I am doing more and more charting to illustrate citizenship and multiculturalism issues and in consulting with those who have a better graphic sense than I, came across this convincing article and illustration against the use of pie charts. Let’s start this off with some honesty. I used to love pie charts. I thought they were great, just like the way I used to think Comic Sans was the best font ever. But then I had some #RealTalk, and I’ve been enlightened in the error of my ways, and I want to pass on what I’ve learned to show people why pie charts aren’t the best choice for visualization. 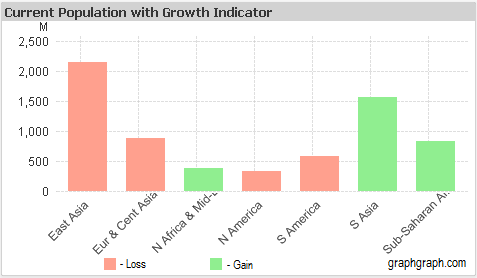 For my day job, part of my work involves creating visualizations out of business data for our customers. I picked up a copy of “Information Dashboard Design” a book by Stephen Few of Perceptual Edge. If you’re at all interested in data visualization, I highly recommend his books, and on this site we attempt to use a lot of the principles in creating the visualizations we present to you. Pie Charts Are Terrible | Graph Graph.